From Tamashii Nations, an exclusive normally available only in Japan! 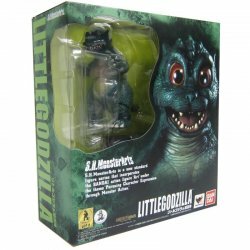 Godzilla 1964 Emergence Version Action Figure from S.H.MonsterArts! This variant will not be reissued. S.H. MonsterArts Godzilla (1964) joined the Tamashii MonsterArts legacy back in 2013. Now he is making a comeback with this exceptional Special Color Version! Fans will recall the striking scene of Godzilla emerging from the earth in a cloud of sand and dust in 1964's Godzilla vs. The Thing! This new edition brings to life that version of Godzilla from this unforgettable moment, decorated with an authentic earthy coloration. Set also includes a Showa-style white breath effect part and effect support. Collectors Note: THIS IS AN ORIGINAL, NOT A KNOCK-OFF FROM JAPAN. Factory sealed. Photos show loose figure but this item comes packed securely in a full color box inside the manufacturer's plain brown box. 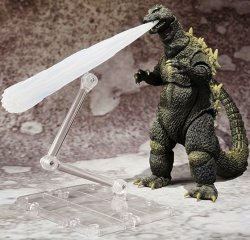 MyMovieMonsters.com also offers other Bandai and Tamashii Nations S.H. MonsterArts figures.